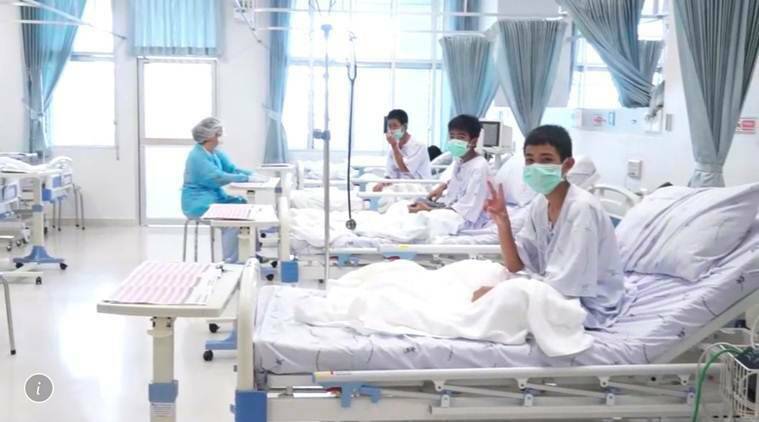 THE rescue of the Thai boys who were trapped in the Chiang Rai cave was followed breathlessly by Indian TV this week but when the drama began to unfold, it didn’t get as much attention here as it did overseas. Maybe because the boys were expected to be trapped for months at the time. Maybe because stories of children falling into holes in the ground are all too common here. But the response was in stark contrast to the rest of the world, where the rescue mission had become an expression of the indomitable human spirit. But interest picked up when the actual rescue began, despite distractions like Elon Musk, who travelled to Thailand to do the Musky thing — propose an impractical technology solution. The contrast between India and the world would have been even more stark if such a drama had unfolded in India. We would have news anchors moderating pointless discussions in navy frogman suits, speaking hollowly through a snorkel. Arnab Goswami would have been apoplectic because Thai divers would not answer his questions from underwater. At least one BJP spokesperson would have alleged that Jawaharlal Nehru had something to do with the cave, and that his great-grandson’s absence from the scene was a matter of shame. Ravish Kumar would have expanded on the theme of caves, from Lascaux and Plato to the present, and arrived at some profoundly depressing but inescapable truth. And the rest of the Hindi channels would have angrily debated if it was a Hindu cave or a Muslim cave. Good news, it appears, is hard to find. ABP TV’s Tvarit speed news programme includes two sections titled sukh and dukh, for news good and bad. On Thursday, the former section contained absolutely nothing while the latter brimmed over — rural drunks were abducting schoolgirls, the people of Shravasti, the city where the Buddha meditated and a tirthankara was born, were thrashing other citizens of Shravasti, a man had been beaten to death in Nalbari for objecting to fireworks at a wedding, a neonatal ward had gone up in flames and someone had committed suicide live on Facebook. Clearly, the wires had failed to bring in any feelgood stories to kick off the day, and the anchors explained, without the slightest irony, that while good news cheers you up, the bad news is also good for you. But good news exists. Check the count of your Twitter followers, and you might see a decline. The platform suspended over 70 million dodgy accounts in May and June, which is about twice the rate from last autumn, when it began to cleanse its stables following news that it had been used by Russian trolls to influence the US elections. Twitter was accused of shying away from a combing operation for fake accounts and bots for fear that the falling numbers would bring down its prospects in the stock market. However, it seems to be reacting to the abuse of social media much more proactively than its peers. A furore over the nitty-gritty of rice and sitaphal has broken out after Chandramani Kaushik, a farmer from Chhattisgarh’s Kanker district, told ABP News that she enlarged upon the truth in her conversation with the prime minister last week, which was aired on Doordarshan. Kaushik told an ABP reporter that she had been tutored by an official from Delhi to state that her farm income had doubled. Her panchayat dismissed the claim. The government of Chhattisgarh and central ministers dismissed everything as fake news, claiming that Kaushik had spoken of incomes from sitaphal, and not rice. Then it turned out that the income was divided among a group of 12 women, which brought it down to a subsistence wage. And Pushpa Manikpuri, one of the 12, told the same reporter that Kaushik had made the claim only to advance the interests of the group, and that in reality, no profits had been made. Many versions, and wavering truths and half-truths. If Rashomon were an agricultural epic from the Stalinist era, it would have been something like this. A deeply metaphysical debate has broken out online following the spread of a video clip of Jeon Gwang-ryeol, a reporter for the South Korean TV channel MBN, who was kissed while doing a piece to camera by two Russian women in a celebratory mood. It was perfectly harmless, but there was much pettifoggery about what the public reaction would have been if the genders were reversed. Sure, it would have constituted harassment. But the debate was completely pointless: harassment exists as a category precisely because the genders are not equal. Published on Fri, 13 Jul 2018 18:57:31 GMT, © All rights reserved by the publisher.